The FAA is empowered by regulations to promote aviation safety and establish safety standards for civil aviation. The FAA achieves these objectives under the Code of Federal Regulations (CFR), which is the codification of the general and permanent rules published by the executive departments and agencies of the United States Government. The regulations are divided into 50 different codes, called Titles, that represent broad areas subject to Federal regulation. FAA regulations are listed under Title 14, “Aeronautics and Space,” which encompasses all aspects of civil aviation from how to earn a pilot’s certificate to maintenance of an aircraft. Title 14 CFR Chapter 1, Federal Aviation Administration, is broken down into subchapters A through N as illustrated in Figure 1-12. For the pilot, certain parts of 14 CFR are more relevant than others. During flight training, it is helpful for the pilot to become familiar with the parts and subparts that relate to flight training and pilot certification. For instance, 14 CFR part 61 pertains to the certification of pilots, flight instructors, and ground instructors. It also defines the eligibility, aeronautical knowledge, and flight proficiency, as well as training and testing requirements for each type of pilot certificate issued. 14 CFR part 91 provides guidance in the areas of general flight rules, visual flight rules (VFR), and instrument flight rules (IFR), while 14 CFR part 43 covers aircraft maintenance, preventive maintenance, rebuilding, and alterations. The FAA headquarters are in Washington, DC, and there are nine regional offices strategically located across the United States. The agency’s two largest field facilities are the Mike Monroney Aeronautical Center (MMAC) in Oklahoma City, Oklahoma, and the William J. Hughes Technical Center (WJHTC) in Atlantic City, New Jersey. Home to FAA training and logistics services, the MMAC provides a number of aviation safety-related and business support services. The WJHTC is the premier aviation research and development and test and evaluation facility in the country. The center’s programs include testing and evaluation in ATC, communication, navigation, airports, aircraft safety, and security. Furthermore, the WJHTC is active in long-range development of innovative aviation systems and concepts, development of new ATC equipment and software, and modification of existing systems and procedures. Accomplishing certification, inspection, surveillance, investigation, and enforcement. Managing the system for registration of civil aircraft and all airmen records. The focus of interaction between Flight Standards Service and the aviation community/general public is the Flight Standards District Office (FSDO). The FAA has approximately 80 FSDOs. [Figure 1-13] These offices provide information and services for the aviation community. FSDO phone numbers are listed in the telephone directory under Government Offices, DOT, FAA. Another convenient method of finding a local office is to use the FSDO locator available at: www.faa.gov/about/office_org/field_offices/fsdo. Figure 1-13. 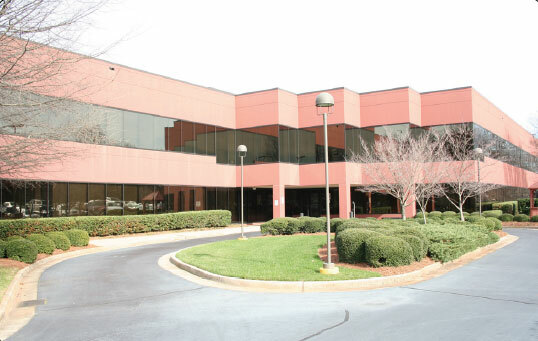 Atlanta Flight Standards District Office (FSDO). In addition to accident investigation and the enforcement of aviation regulations, the FSDO is also responsible for the certification and surveillance of air carriers, air operators, flight schools/training centers, and airmen including pilots and flight instructors. Each FSDO is staffed by Aviation Safety Inspectors (ASIs) who play a key role in making the nation’s aviation system safe. The ASIs administer and enforce safety regulations and standards for the production, operation, maintenance, and/or modification of aircraft used in civil aviation. They also specialize in conducting inspections of various aspects of the aviation system, such as aircraft and parts manufacturing, aircraft operation, aircraft airworthiness, and cabin safety. ASIs must complete a training program at the FAA Academy in Oklahoma City, Oklahoma, which includes airman evaluation and pilot testing techniques and procedures. ASIs also receive extensive on-the-job training and recurrent training on a regular basis. The FAA has approximately 3,700 inspectors located in its FSDO offices. All questions concerning pilot certification (and/or requests for other aviation information or services) should be directed to the local FSDO. The FAA is dedicated to improving the safety of United States civilian aviation by conveying safety principles and practices through training, outreach, and education. The FAA Safety Team (FAASTeam) exemplifies this commitment. The FAASTeam has replaced the Aviation Safety Program (ASP), whose education of airmen on all types of safety subjects successfully reduced accidents. Its success led to its demise because the easy-to-fix accident causes have been addressed. To take aviation safety one step further, Flight Standards Service created the FAASTeam, which is devoted to reducing aircraft accidents by using a coordinated effort to focus resources on elusive accident causes. Each of the FAA’s nine regions has a Regional FAASTeam Office dedicated to this new safety program and managed by the Regional FAASTeam Manager (RFM). The FAASTeam is “teaming” up with individuals and the aviation industry to create a unified effort against accidents and tip the safety culture in the right direction. To learn more about this effort to improve aviation safety, to take a course at their online learning center, or to join the FAASTeam, visit their website at www.faasafety.gov. 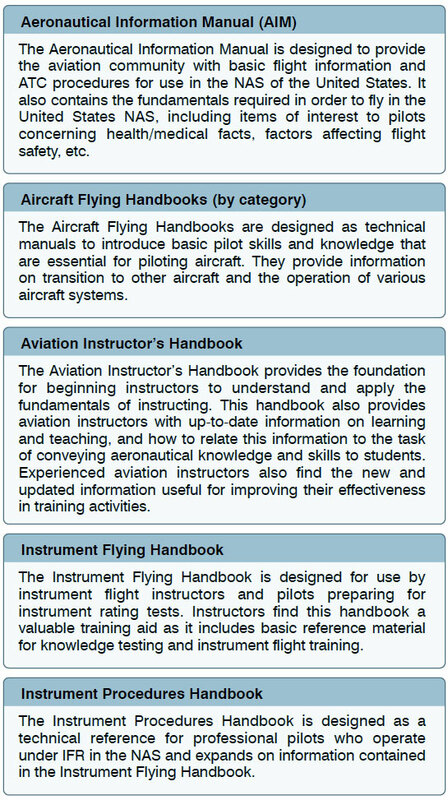 The FAA provides a variety of important reference material for the student, as well as the advanced civil aviation pilot. In addition to the regulations provided online by the FAA, several other publications are available to the user. 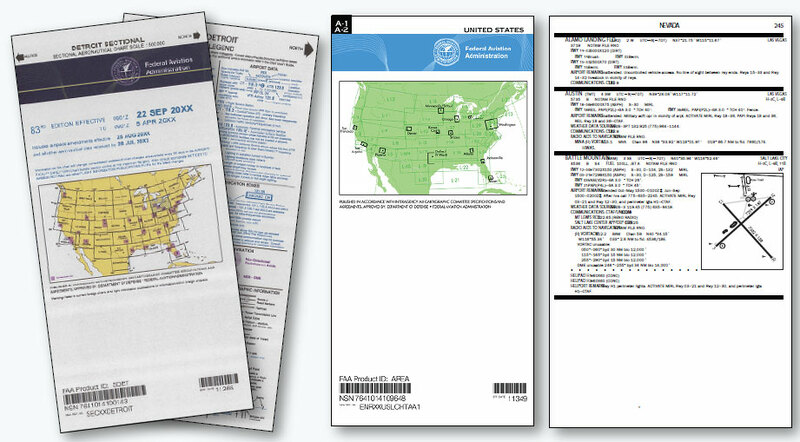 Almost all reference material is available online at www.faa.gov in downloadable format. Commercial aviation publishers also provide published and online reference material to further aid the aviation pilot. 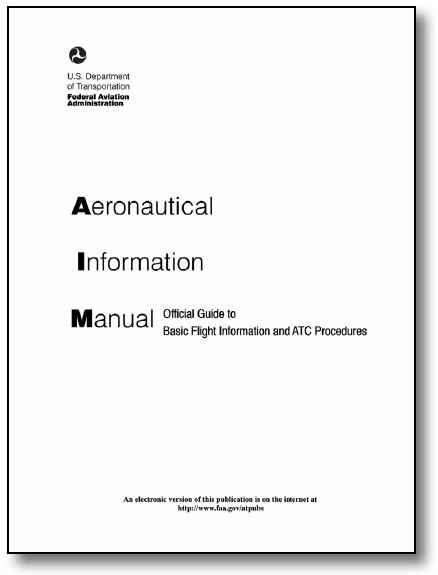 The Aeronautical Information Manual (AIM) is the official guide to basic flight information and ATC procedures for the aviation community flying in the NAS of the United States. [Figure 1-14] An international version, containing parallel information as well as specific information on international airports, is also available. The AIM also contains information of interest to pilots, such as health and medical facts, flight safety, a pilot/controller glossary of terms used in the system, and information on safety, accidents, and reporting of hazards. This manual is offered for sale on a subscription basis or is available online at: http://bookstore.gpo.gov. Figure 1-14. Aeronautical Information Manual. Order forms are provided at the beginning of the manual or online and should be sent to the Superintendent of Documents, United States Government Printing Office (GPO). The AIM is complemented by other operational publications that are available via separate subscriptions or online. can be downloaded free of charge from the FAA website. Figure 1-16. 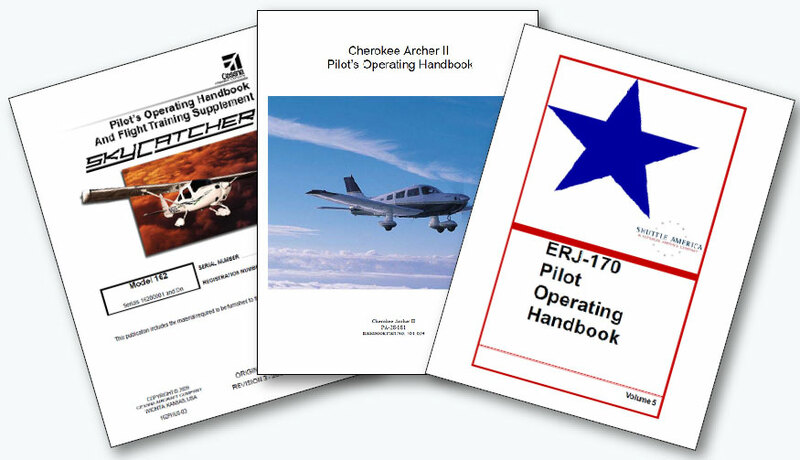 Pilot Operating Handbooks from manufacturers. 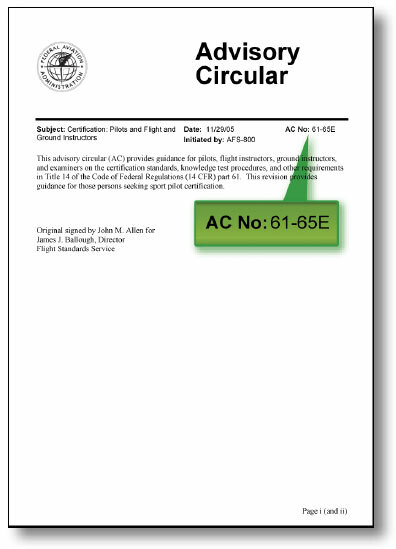 An AC is an informational document that the FAA wants to distribute to the aviation community. This can be in the form of a text book used in a classroom or a one page document. Some ACs are free while others cost money. They are to be used for information only and are not regulations. The FAA website www.faa.gov/regulations_policies/advisory_ circulars/ provides a database that is a searchable repository of all aviation safety ACs. All ACs, current and historical, are provided and can be viewed as a portable document format (PDF) copy. Figure 1-17. Example of an Advisory Circular in its fifth revision. The FAA, in concert with other government agencies, orchestrates the publication and changes to publications that are key to safe flight. Figure 1-18 illustrates some publications a pilot may use. a sample of a page from the supplement.